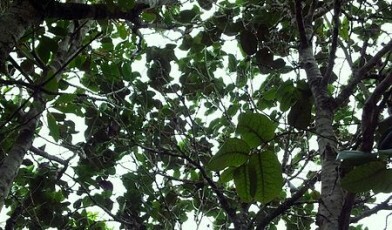 A tree growing to between 3 and 5 m tall, Diospyros egrettarum is endemic to Mauritius. Fewer than 10 individuals remain on the mainland but a nearby coral island, Ile aux Aigrettes, boasts a larger population. The tree is considered Critically Endangered on the IUCN Red List. It is found in 5 botanic garden ex situ collections worldwide. Ile aux Aigrettes has been a Nature Reserve since 1965 which is helping to protect this species. Like many ebonies, it has been heavily extracted for timber. A ban on logging is now in place. Undisturbed Diospyros egrettarum forest is resistant to invasion by exotic species, however logging and land use changes have made these forests susceptible. Positive progress on the Ile aux Aigrettes has been made to eradicate exotic plants and rats, improving the survival of Diospyros egrettarum. Though threatened by invasive exotic plant species, it is also limited by seed dispersal, preventing the forest from expanding. This species relied on species long extinct, such as the giant tortoise, to disperse their large seeds. Recent efforts to improve the conservation status of this species include the successful introduction of Aldabran giant tortoises to replace their extinct counterparts on Ile aux Aigrettes to improve seed dispersal. Griffiths, Christine J. et al., (2011) Resurrecting Extinct Interactions with Extant Substitutes. Current Biology. Volume 21. Issue 9. pp 762 – 765. Parnell, J.A.N., Cronk, Q., Wyse Jackson, P. & Strahm, W. (1989). A study of the ecological history, vegetation and conservation management of Ile aux Aigrettes, Mauritius. Journal of Tropical Ecology, 5, pp 355-374. doi:10.1017/S0266467400003825.